I absolutely loved shooting this wedding at Mercer county park! 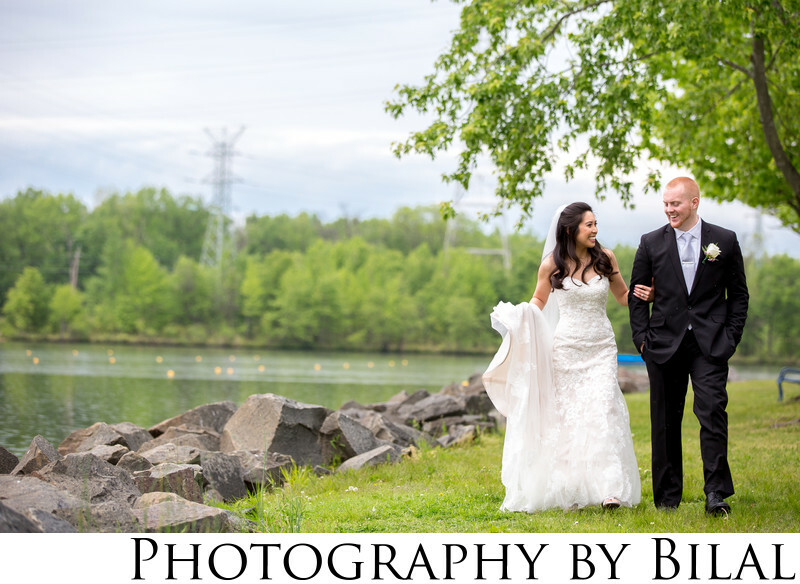 Just looking at the radiant smile on the bride in this image gives me a happy feeling - you can just feel the joy from the couple as they take a casual walk along mercer lake. This is the feeling that I strive to capture in my work as a wedding photographer. To me photography is not about just clicking a button. It's about being able to invoke true feelings and then capture them as I have done here. It's about being able to find the beauty in any location. It's about being able to compose the shot to make the scene look enticing and beautiful. Believe it or not, this park was full of visitors, but, can you tell? Of course not, if I would have composed it differently, the visitors would have taken away from the image and would have made it less appealing. I wanted to make it all about the couple and their happy moment together. I personally feel that an image like this, captured naturally, is worth much more than an image in which the couple is looking directly at the camera. I personally feel the magic happens when the couple engages with each other, and that's the moments that I like to capture so the couple can look back at them during their 50th wedding anniversary :). Location: 1638 Old Trenton Rd, West Windsor Township, NJ 08550.